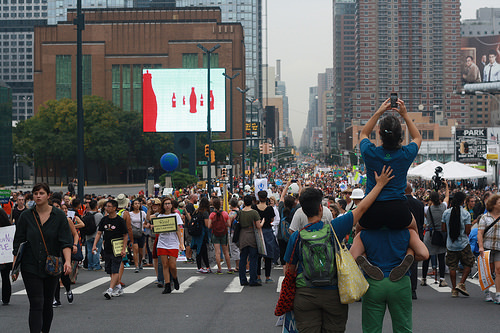 A swath of midtown was completely shut down as participants in yesterday’s Peoples Climate March came together for a block party of sorts in Midtown, hours after the march. 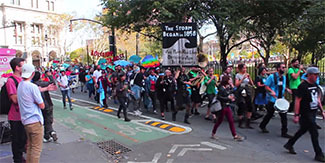 The march itself, which was over 400,000 strong, came to a close between 33rd street and 11th avenue, but for the next five blocks marchers and activists who were unable to make it to the march in the morning, joined in an act of solidarity. 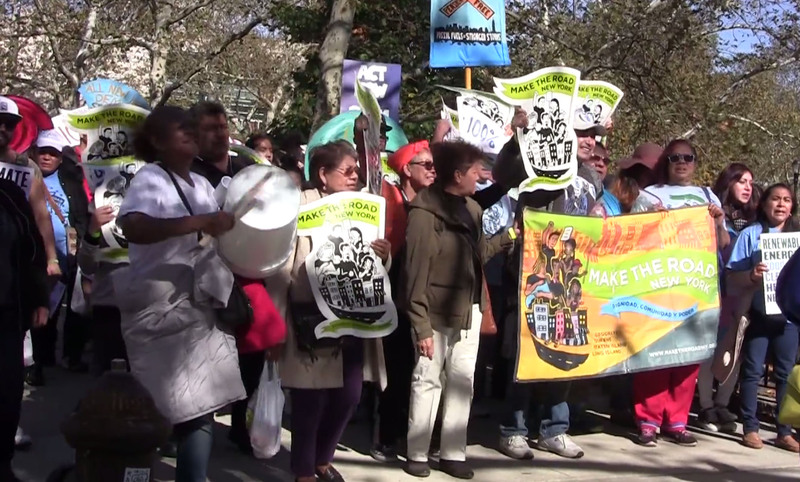 They told the stories of the communities struggling with the effects of climate change. Ray West, 63, from Shoreline Wash, and Carmen Gilmore, 46, of Bellingham, Wash. both traveled together as representatives of their 350.org chapters the environmental organization whose aim is to build a global movement for climate solutions and organized the march. 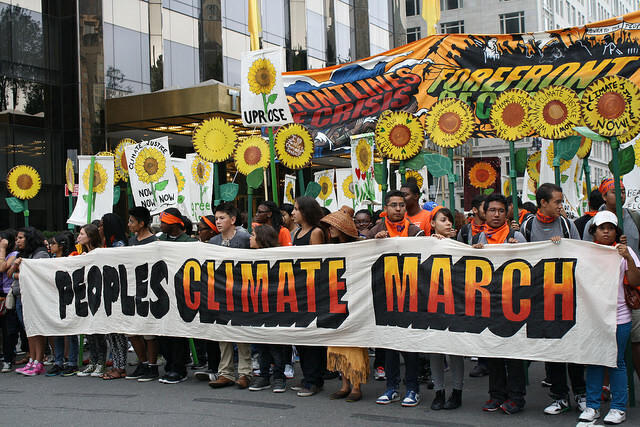 The pair felt that Washington had been hit extremely hard by the consequences of climate change. West said there is no doubt that the planet is warming. Coming from the opposite end of the country Kyle Gibson, 28, Maine of the Beehive Collective, which looks to attack climate change not just with their words, but also with their art. The collective had a series of tarps set up on the sidewalk that visualized the history of our planets climate. Visual graphics were used by the group to explain political issues and connect them to economic and ecological problems. In recent years Machias, Maine, the town the group is based out of, has been devastated by the effects of climate change. They lost their once thriving timber and fishing industry. The collective looks to tell the story of their town to as many people as possible. What left in the town is an aging population with less ability to revitalize the community, as most of the younger people have went elsewhere to find work. As the gathering came to a close, some of the marchers shared their stories with each other. Mak Ska Higa, 70, from Black River Falls, Wis., came as a member of an anti-fracking group based out of Madison, Wis. As a Native American, his opposition to fracking comes as a result of a more spiritual connection to the land. 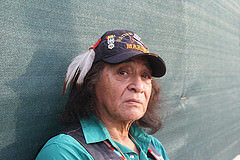 A member of the Ho-Chunk-Wakajexi clan, better known as the Winnebago Tribe has a history of fighting said Higa. His family was one of the families to survive the colonization of the United States.